Increased competition in the broadcast market is forcing broadcasters to produce more and more original programming, and to enrich the viewer experience at the same time with immersive audio and OTT content. These changes are increasing broadcasters’ processing overheads, while at the same time their budgets are being squeezed. To meet these changing needs of modern production, processing equipment needs to be flexible, scalable, and most importantly, able to be deployed more efficiently. Audio networking technologies like Calrec’s Hydra2 helped to break the traditional hard ties between control room and studio. It allowed shows to be produced from any control room, regardless of which studio they are in, providing redundancy and more efficient utilisation of control room equipment. Products like Calrec’s RP1 Remote Production unit take this a step further by allowing remote locations to be virtualised within a broadcast facility, greatly reducing the quantity and complexity of equipment and staffing needed at event venues. These technologies allow for efficiency improvements by minimising the down-time of equipment between productions, and vastly speeding up setup time. The next step is to break the hard ties between control room and equipment room, allowing the processing equipment to be deployed for any production, in any control room. By being able to have processing equipment switch between different production control rooms, down time is further minimised and the return on capital expenditure is maximised. This can be taken a step further still, by having a remote equipment room where space is freed up in studio complexes (which are often located in areas of high property value) and broadcast trucks (where space also comes at a premium). 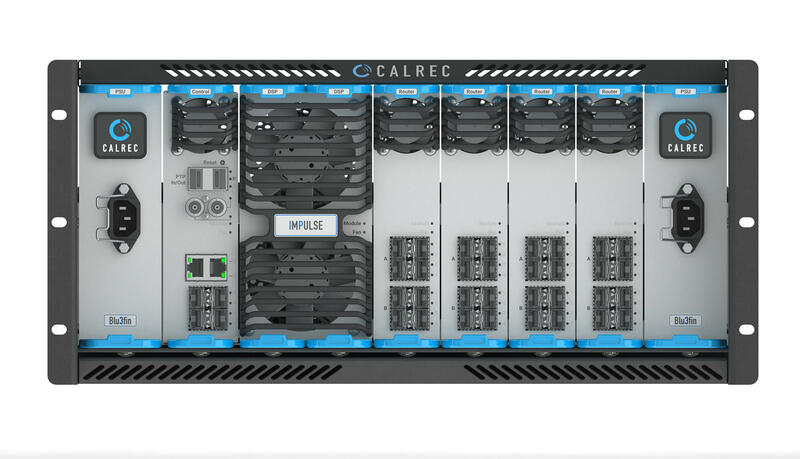 At IBC 2018, as a response to these changing demands, Calrec unveiled the Impulse core, a next generation audio processing and routing platform. But what exactly is the Impulse core and how does it fit in broadcast workflows? As facilities increase the number of audio channels that must be managed, new audio networking technology makes it possible to remove the traditional ties that exist between control room and studio. The result provides higher redundancy and more efficiency. Calrec’s Bluefin2 platform, in conjunction with Hydra2 audio networking, has served broadcasters all over the world incredibly well, and it will continue to do so for many more years to come. Bluefin2 and its predecessor, the original Bluefin, were truly ground-breaking in terms of audio signal processing capacity and reliability. 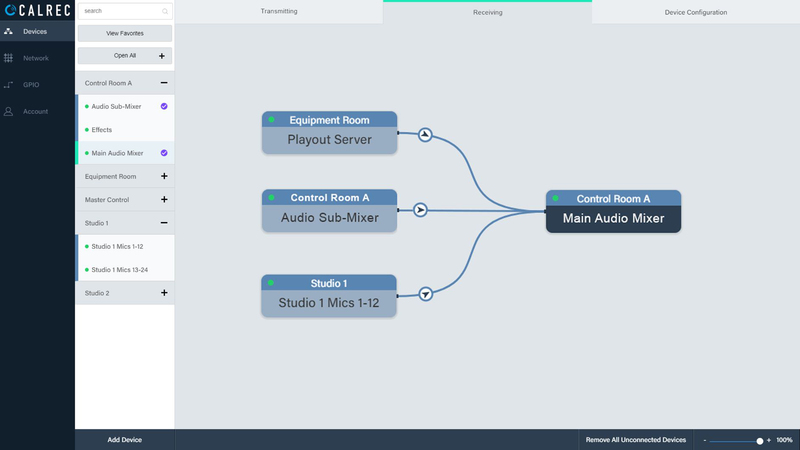 Bluefin2 can provide over 1300 audio processing paths, including up to 1020 fully featured input channels, with a broadcast-focussed feature set including native surround and comprehensive monitoring and metering. Over the years, new features have been added to meet changing demands, including the recent addition of support for 3D immersive monitoring for users that are creating content for delivery over Dolby Atmos and MPEG-H. However, it is time for Calrec to take the next step forward, with a new processing platform, that is more flexible, and that can be scaled up even further to support future demands. Impulse contains the next iteration of DSP – “Bluefin3”, which is modular, and hugely scalable, allowing users to expand as and when they need to, ensuring that broadcasters’ ambitions of scale are not limited by processing capabilities, and providing more than enough headroom for the development of new features to support future demands. The Impulse core can run multiple fully independent mix engines, providing efficiency savings by being able to consolidate the processing hardware for multiple productions. Impulse mixers can be controlled by existing Apollo or Artemis surfaces, or headless operation via a web UI and/or various forms of production automation systems. Traditionally, a mixer needs to be purchased for each control room with a capacity large enough for the biggest show that is produced from that room. Such large shows may only come occasionally, which results in a lot of processing hardware being massively under-utilised. The Impulse licensing model allows customers to easily increase DSP capacity as and when needed. In the future Calrec is looking to provide time-based licenses to allow customers to effectively rent DSP by the day. Further, available DSP can be freely allocated between the different mix-engines running in the core, allowing customers to change how much is available to each production based on day-to-day needs. COTS IP connectivity is also a key part of the Impulse ethos, providing flexibility and more freedom in geographic location. It allows surface and web UI control from remote locations as well as switching which surface is controlling which mixer for more efficient utilisation of processing power. Aimed at supporting the changing demands of broadcast moving forward, Impulse is hugely scalable and equally at home in the traditional studio complexes and broadcast trucks of today as well as the server centres of tomorrow. Continuing the standardised IP theme, Calrec is fully committed to the JT-NM and AIMS roadmap for IP interoperability, so Impulse’s audio connectivity is native AES67/ST-2110 to the highest conformance levels with 2022-7 hitless packet merging for reliable connectivity across hostile networks. Its AoIP routing capacity is scalable from 2048×2048, up to 16,384×16,384 audio channels in and out. As well as getting signals in and out of the DSP, it can be used for stream forwarding and channel shuffling, with SW-P-08 support for remote control over cross-point switching. People love using Hydra2 audio networking for its truly plug-and-play nature; when an I/O box is plugged in it automatically comes up and is available straight away for users to patch audio to. Hydra2 networks are deterministic, allowing them to comfortably pass 512 channels of audio in each direction at very low latency with zero packet loss. The drawback, however, is that to do this it can only pass over Calrec-specific hardware; it cannot be routed through COTS switches and its data paths cannot be shared by third parties. Calrec’s H2Hub was developed to provide a cost-effective and portable solution to aggregating Hydra2 paths, reducing the number and length of cables/fibres that need to be run and freeing up more expensive Hydra2 router ports. Hydra2 data can also be consolidated and passed over shared fibres by using CWDM systems, and the H2-IP Link product allows Hydra2 audio and control data to be tunnelled through IP networks, to extend the geographic range of the network. All this contributes to the continued success of Hydra2. However, in this era of IP and open standards, broadcasters want more. They want to be able to pass audio, video, control and other data of all sorts over the same common shared COTS IP networks, and they want to be able to more directly share video, audio and data between devices made by different manufacturers. Standardised IP connectivity eradicates much of the cost, space, system complexity and cabling overhead of having a multitude of interface panels for analogue, AES3, MADI, SDI etc. This is the goal of both AES67 and ST-2110 (which is essentially the same as AES67 when relating to audio), and it’s already here, with more and more vendors and broadcasters around the world adopting it. While standardised audio over IP will see “direct” connectivity between equipment over an IP network, there’s still going to be a place for I/O boxes for quite some time to come, and it’s vital that vendors support users with their migration to IP. Purchasing IP-based equipment should not make pre-existing equipment redundant; existing systems should both interface and integrate with IP-based systems. Calrec has developed a replacement for the Hydra2 modular I/O controller card that can operate in either Hydra2 or AES67/ST-2110 mode, which can be retro-fitted into any existing modular I/O frames as a direct drop-in replacement. There’s a similar retro-fit upgrade option for the Fixed Format Hydra2 I/O boxes. In addition, the new H2-IP Gateway product provides a bridge between the Hydra2 and AoIP worlds, passing channel labels and control such as mic pre-amp gain in both directions, allowing a user with an Impulse core access to audio and control from a Hydra2 network and vice-versa. The upgrade path has always been important to Calrec, and these latest developments help broadcasters migrate to AoIP transport and ultimately the world of distributed and virtualised processing, without having to throw out their investment in existing equipment. Impulse is a scalable platform to build on, and users will benefit from future additions and innovations that utilise the power and flexibility of the architecture. Another key development from Calrec is the “Connect” IP stream management tool. AES67 & ST-2110 only define the transport mechanism, they do not offer a standardised approach to the advertisement of streams or their connection management, and the challenge of connecting IP streams between devices is often overlooked. This is a frustration as to date it often requires engineers with laptops moving between web-apps of each device, looking at complex parameter sets, sometimes having to resort to command line configuration and hacks to get devices from different manufacturers to see and connect with each other’s streams. This is simply not good enough; to be successful IP needs to fit into more familiar and simpler operational workflows. Connect provides a simple, visual and familiar workflow for very quickly creating and connecting IP streams between devices, with a centralised network-wide approach. More complex parameters and diagnostics are available, but these are abstracted from the normal operational view. Flexible multi-user management over functionality and individual streams and devices is also an important facet provided by Connect. Calrec fully supports NMOS as the means to allow equipment from different manufacturers to advertise and connect streams in a standardised way and with a central viewpoint. Like all Calrec’s other AoIP-based equipment, Connect and the Impulse core support NMOS, allowing connections between Calrec and other vendors to be managed as though all the equipment were from a single manufacturer. With some hesitance in the uptake of NMOS by some vendors, Calrec AoIP products also support other discovery and connection methods to ensure widespread interoperability, such as mDNS/Bonjour for Ravenna-based devices, SAP for Audinate devices, and the potential to adopt others such as AES70 or more manufacturer-specific APIs. In summary, the Impulse core is Calrec’s brand-new, hugely powerful, scalable and flexible next-generation audio processing and routing platform that will carry broadcasters forward with a clearly defined upgrade route both for existing surfaces and I/O, as well as for future functionality. It boasts enormously powerful Bluefin3 DSP capabilities, immersive NGA path widths with height and 3D panning, comprehensive and configurable up/downmixing between path widths, and native IP connectivity fully conforming to AES67 and SMPTE ST2110, with ST-2022-7 seamless packet merging. Designed for use in the cloud, and the world of virtualised audio processing, it’s equally at home in the more typical broadcast production environment or truck. Impulse provides a cost-effective and scalable solution for the next generation, supporting the increasing demands and ambitions of broadcasters around the world.